File photo of NC GOP Chair Dallas Woodhouse, who said he wants the state election board to fully lay out the facts in its investigation of the 9th Congressional District race. State GOP Chair Dallas Woodhouse said he wants the state elections board to fully lay out the facts in its investigation of North Carolina's 9th Congressional District race between Republican Mark Harris and Democrat Dan McCready. In uncertified results from the November election, Harris leads McCready by 905 votes. But a majority of the elections board, including two of its four Republicans, voted to delay certifying the results pending an investigation and evidentiary hearing into possible vote tampering in Bladen and Robeson counties. "If they can show with certainty that the outcome could not have been changed," Woodhouse said in a texted statement to WUNC, "they need to certify Mr. Harris and continue to support all state and federal criminal investigations." But Woodhouse said he would fully support a new election if the board's investigation showed a substantial likelihood any vote tampering or irregularities could have changed the contest's outcome. "If they hold a public hearing and simply can't determine one way or the other," Woodhouse added, "then we would not oppose a short delay on the question of certification until they have more answers." 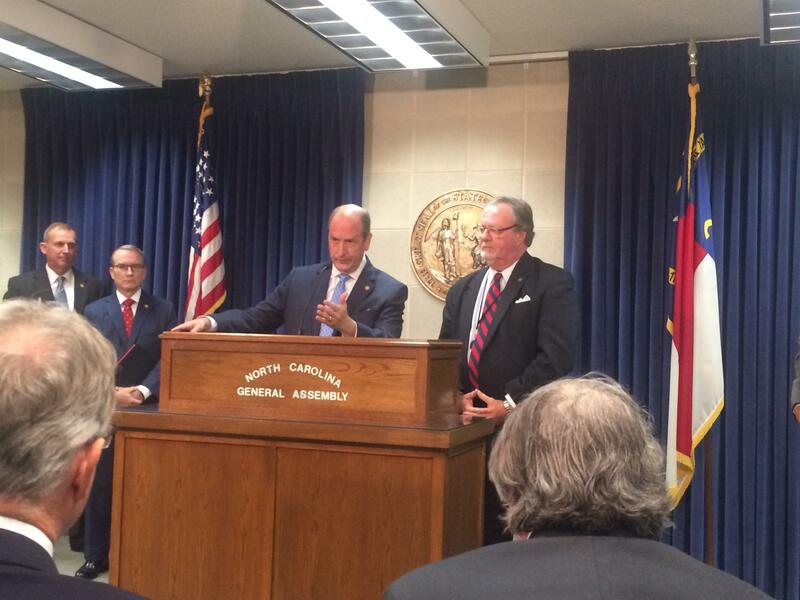 Sen. Dan Bishop (R-Mecklenburg), center, Sen. Tommy Tucker (R-Union), right, Sen. Paul Newton (R-Cabarrus, Union), near left, and Sen. Harry Brown (R-Jones, Onslow), far left, call for the governor to form a bi-partisan task force to investigate a history of voting irregularities in Bladen County. Woodhouse's comments seem somewhat at odds with statements made by a group of GOP state senators Thursday. The group called on Govenor Roy Cooper, a Democrat, to form a bi-partisan task force to investigate what they say is a history of voting irregularities in Bladen County spanning multiple election cycles. "Get the feelings and emotions and partisanship out of it, and move forward and clean it up," said state Sen. Tommy Tucker (R-Union), suggesting such a task force would be better equipped than the state elections board to undertake such a probe. But Sen. Dan Bishop (R-Mecklenburg) was hard pressed to explain why the state elections board should not be allowed to just continue its investigation and why the bi-partisan task force is needed. "I'm not criticizing any step that has been taken," Bishop told reporters. "In fact, I certainly wouldn't have certified that election yet either and I think, it's not that people can't function or won't do their best to act in a bi-partisan manner." "But there are questions that are begged such as I've suggested and it would be better, and we would have the result be better and people have more confidence in it if it were a bi-partisan mechanism," Bishop continued. In an emailed statement to WUNC seeking comment on the GOP senators' call for the task force, Ford Porter, a spokesman for Governor Cooper, said: "There are multiple ongoing criminal investigations and legislators should allow investigators and prosecutors to follow the facts and take appropriate action." The U.S. House of Representatives has the constitutional and legal authority to block a member of Congress from taking a seat and the incoming Democratic leadership has indicated they may do so pending the outcome of an investigation into voting improprieties in North Carolina's 9th district. Meanwhile, North Carolina lawmakers just sent a voter ID bill to the governor for his signature, which would require people to present acceptable photo identification cards to cast a ballot in person. But many opponents of the measure have said that absentee ballots are the real problem when it comes to voter fraud. With near unanimity, the state house added a Democrat-backed amendment tightening rules around submitting absentee ballots. A voter photo identification bill won state House approval Wednesday, a proposal now also altered to try to improve absentee ballot security in North Carolina in light of fraud allegations in a congressional district.